We can’t talk about recipes until we first tell you how to choose oysters, how to store them and how to open them. We'll also give you some of our favourite serving hints and the low down on oyster nutrition. When choosing oysters the primary consideration is freshness. We can guarantee you this at Future Seafoods. However, when buying from a store or market, make sure that they have a good turnover of oysters. The oysters should feel heavy in your hand and should not sound hollow when tapped. Do not choose any that smell and don’t buy any that are open. The shape of the shells will give you a good idea of the amount of meat you are getting. The deeper the cup of the lower shell, the better. Our oysters have a superior shelf life - When refrigerated, the oyster curls up and hibernates as it does in the winter. Under optimal conditions, fresh oysters will survive up to 3 weeks refrigerated. All oysters have different shelf lives - ours have an exceptionally long life because of our growing conditions. Our oysters have a thick shell as a result of the constant exposure to tides. Once you get your oysters home, don't put them in ice. Stash them in the refrigerator in a mesh bag or in an open container. Never seal live oysters in airtight containers as they will not be able to breathe and will die. Arrange each oyster flat side of the shell up and drape a wet towel over them so the shells don't dry out. Do not wash the shells until you are ready to use them. Shucked oysters must be refrigerated and will keep for about 7 days - longer if frozen. Most oysters these days have fairly clean shells but if you have to clean them, scrub the beards and dirt from the shells while holding them under cold running water. You’ll need a shucking knife and you may want to invest in a glove - or use a towel - to protect your hand. GO SLOW - you don’t want to injure yourself. Step 1: Hold the oyster firmly in one hand, knife in the other. Wear a protective glove or drape a cloth over the hand holding the oyster - the shell ridges are sharp! Slip the knife blade between the top and bottom shell right by the hinge on back. Using a twisting motion, pry the top and bottom shells apart. Be gentle but firm so you don’t lose any of the liquor inside. The liquor should be clear, not cloudy and not have any unfavourable smell. Step 2: Run the knife all the way around the oyster until you get to the other side. Put some muscle into it but be careful - this is where you can cut or stab yourself. Step 3: Cut the oyster free from its shell - it'll be connected by a tough muscle on its underside. Slide your knife under and sever it. Serve on the shell or spoon meat into a glass. Step 4: Voila - you are done! Raw oysters should always be served chilled on a bed of ice. Thinly-sliced, buttered pumpernickel or hearty grain bread complete the raw oyster eating experience. The incomparable silky-firm texture and mineral sweetness of a fresh oyster are best savoured unadorned or, at the very most, with a squeeze of lemon. However, some of you may enjoy them with a little grated horseradish, mignonette sauce (a combination of pepper, vinegar, and a little shallot ), and/or spicy cocktail sauce. Tossing the oysters in the freezer for 10 to 15 minutes will relax their muscles and make them easier to shuck. Just don’t forget them there! Smaller and younger oysters will most likely be tenderer. Most importantly, cook oysters gently to avoid turning them into a rubbery, chewy waste of good shellfish. When the edges begin to curl, they've had enough heat. Herbs that pair well with oysters include thyme, fennel seed, paprika, and parsley. 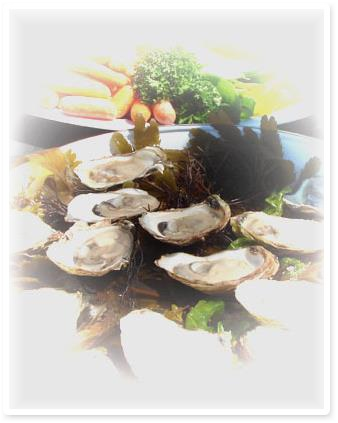 ZINC: It is a fact that the best natural source of zinc is oysters! The recommended daily allowance is 15 mg. An oyster a day provides all your daily zinc requirements. It is an immune system booster, decreases cholesterol deposits and is said to be the secret of the oyster’s aphrodisiac effect - zinc is closely interrelated with testosterone and has been shown to be useful in the prevention and treatment of male infertility. IRON: Essential for the proper functioning of red blood cells. VITAMIN B12: Essential for the maintenance of nerve fibres and the making of red blood cells. Oysters are a good source of high quality protein, and they are naturally low in fat, sodium and calories.. 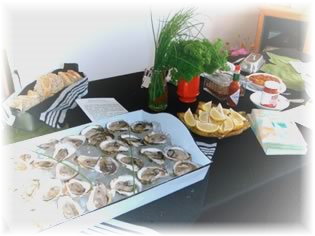 The National Heart and Lung Institute suggest oysters are anideal food for inclusion in low-cholesterol diets. TRULY A WONDER FOOD! • Shuck 12 fresh oysters. Serve in their half shells on a bed of crushed ice. •Offer slices of fresh lemon, Tabasco or any other hot sauce. •Serves 4 as an appetizer. Put one shucked oyster in a shot glass, add 2 drops Tabasco or another favourite hot sauce, 1 drop vinegar, salt and pepper and top it with your favourite beer - Brian recommends a honey lager. You then drink it up. You can experiment with different beers (stout, honey lager, even white wine). It is a very refreshing treat. Combine the ingredients in a glass or stainless-steel bowl. Cover with plastic wrap and store at room temperature overnight. Mignonette sauce will keep for months in the refrigerator. This recipe yields about ¾ cup. Another way to serve the Mignonette Sauce is to freeze it in a shallow dish. When ready to serve, take it out and break it up with a fork. Place one teaspoon of the shaved frozen sauce on each oyster and serve immediately. In a small bowl, combine the rice wine vinegar, shallots, ginger, cucumber, black pepper, and cilantro - mix with a fork. Cover and chill for at least 1 hour or up to the day before you plan to serve to allow the flavours to come together. Serve with raw oysters. This recipe yields 1 cup. Wash the shells, place on a cookie sheet to catch the liquid and bake at 500 degrees for 15-35 minutes, depending on the size. Some shells will not be opened, so some prying will be necessary. You may eat them plain or dip them in a favourite butter sauce. HINT: Oysters cooked "cup up" will hold the liquid, making a juicier meat. "Cup down" results in the juice draining out, causing a drier oyster. You can open and cook oysters in the microwave. Scrub oysters under running water. Place oysters in a glass casserole dish. Microwave on defrost for 1 - 2 minutes. Remove from oven and shuck immediately. Oysters are uncooked. To completely open an oyster, microwave for 3 minutes on high. Meat will be thoroughly cooked. 12 Premium Rocky Bay Oysters shucked and on the half shell. Place oysters on a cookie sheet; put some cracker crumbs on top of the oysters. Add a drop of Tabasco or your favourite hot sauce and sprinkle Fresh lemon juice over all. Put a little grated mozzarella cheese over the oysters and barbecue with lid closed until cheese melts. Serve 3-4 as an appetizer. Wash the shells and place "cup up" on the barbeque for 15-45 minutes, depending on oyster size. Place in foil cups to prevent juice flowing out. Watch for oysters starting to open to indicate they’re done. Again, some shells will not be opened, so some prying will be necessary. Serve with your favourite accompaniments. Wash the shells and place in a steamer for 10-20 minutes, depending on size. You will notice some oysters opening and that should indicate that they’re done. In a bowl mix flour, garlic powder and a little pepper. Roll oysters in the mixture and place in frying pan with melted butter. Fry until lightly crisp. Sprinkle with lemon juice and serve. This is Brian's version of the classic Oyster Rockefeller recipe. Clean oysters and place in a large stockpot. Pour in beer and enough water to cover oysters. Add 2 garlic cloves, salt and Peppercorns. Bring to a boil. Remove from heat, drain and cool. When oysters are cooled, break off and discard the top shell. Arrange the oysters on a baking sheet. Preheat oven to 425 degrees F.
Melt butter in saucepan. Add onion and garlic and cook until soft. Reduce heat and add spinach, Monterey Jack and Fontina. Cook until cheese melts, stirring frequently. Stir in the milk, and season with salt and pepper. Spoon sauce over each oyster, just filling the shell. Sprinkle with bread crumbs and bacon bits. Bake until golden and bubbly, about 10 minutes.